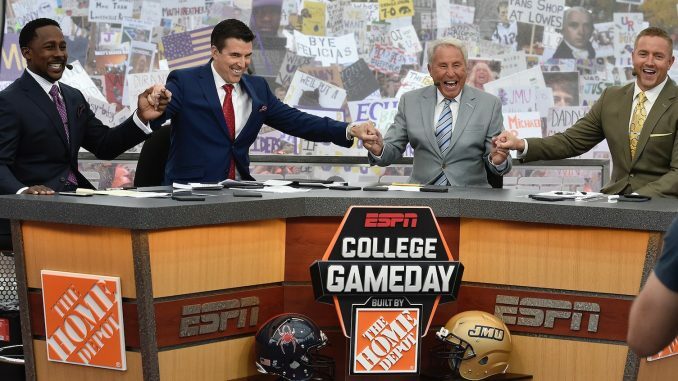 After months of speculation, the wait is finally over: College GameDay is coming to Orlando. Kirk Herbstreit, Lee Corso and the rest of the crew will be in town when UCF takes on Cincinnati next weekend in a game that will decide the AAC East. It will be interesting to see what kind of reaction GameDay receives from UCF fans, who have had a contentious relationship with some of the hosts. Herbstreit made waves earlier this season when he suggested several one-loss Group of Five teams were better than UCF. At the next GameDay, a sign featuring Herbstreit in a UCF hat appeared, as well as several other UCF signs. While getting College GameDay is a huge win for a young program like UCF, the game itself may be the most important regular season game the Knights have ever played. A win would clinch a spot in the conference championship and, given the way the AAC West is stacking up, would likely come close to guaranteeing a spot in a New Year’s Six Bowl. But a loss would essentially snuff out both UCF’s hopes of a conference championship and a major bowl. The stage has never been bigger and the stakes have never been higher than they will be for the Knights on Saturday.